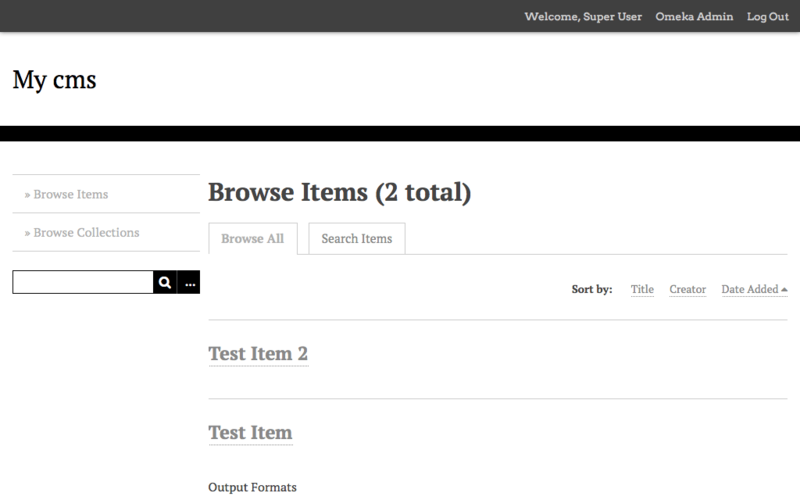 Omeka est une application open source de gestion de contenus (CMS). 30 Mai 2018 - 80MBOmeka 2.6.1 is the first maintenance release in the 2.6 series. All users should update. Google is shutting down the original reCAPTCHA API that Omeka has used, so we're transitioning to the newer, supported "v2" API. This also transitions to the newer "I'm not a robot" checkbox interface. This update brings a new, more modern interface for HTML editors in Omeka, as well as a supported codebase which should lead to improved compatibility with modern browsers now and going forward. Note: internal code and filenames have changed in this version of TinyMCE, so all plugins using HTML editors must be updated. Updated versions of ExhibitBuilder and SimplePages are bundled with the release, but others must be updated, including Commenting, Contribution, Posters, SimpleContactForm, and UserProfiles. Omeka now uses relative URLs for local assets. It was impossible to navigate to the "top" link in nested navigation on a touch-enabled device. Now a single tap opens the menu (as before), and tapping again on the top link will actually navigate. The show page for Collections had the title "Edit Collection"
To keep up with the changing browser support landscape, Omeka now uses HTML 5's audio and video tags when embedding audio and video, instead of the object and embed tags used by previous versions. This change means generally better support for newer formats on current desktop and mobile browsers (for example, fixing a bug where audio files would improperly auto-play on Chrome), but worse support for older video formats, particularly those that rely on browser plugins like Quicktime, Windows Media Player or VLC. Site visitors will still be able to download those older videos and view them locally, provided they have a video player installed that's capable of playing them. For more information about HTML 5 media support in Omeka, see Media Files. For change information geared toward developers, see What's New in Omeka 2.4 on Omeka's Read the Docs site. 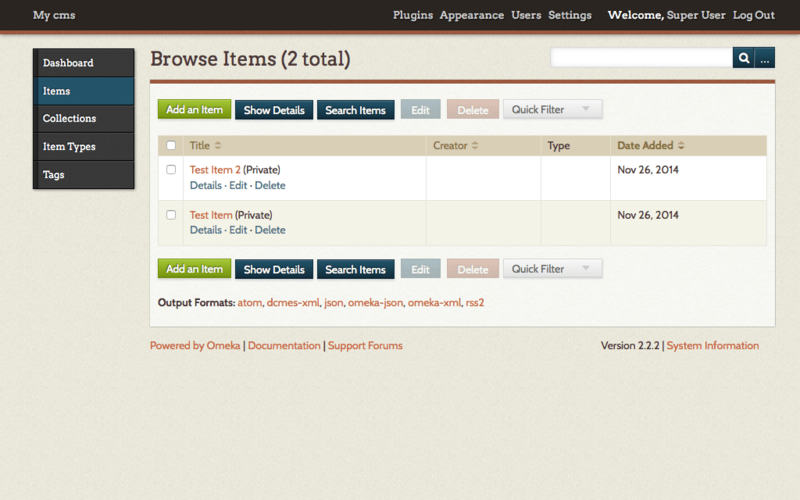 The item shortcodes now allow filtering by item type (#668). The ExternalImageMagick and Imagick file derivative strategies now have a autoOrient option to automatically fix the orientation of images that have an embedded orientation flag. Updates for Czech (cs), Estonian (et), Italian (it), Dutch (nl_NL), Polish (pl), Swedish (sv_SE), and Turkish (tr_TR). 10 Avril 2015 - 80MBThis release includes improved accessibility, with better labels, skip navigation links, and the addition of ARIA roles and landmarks . 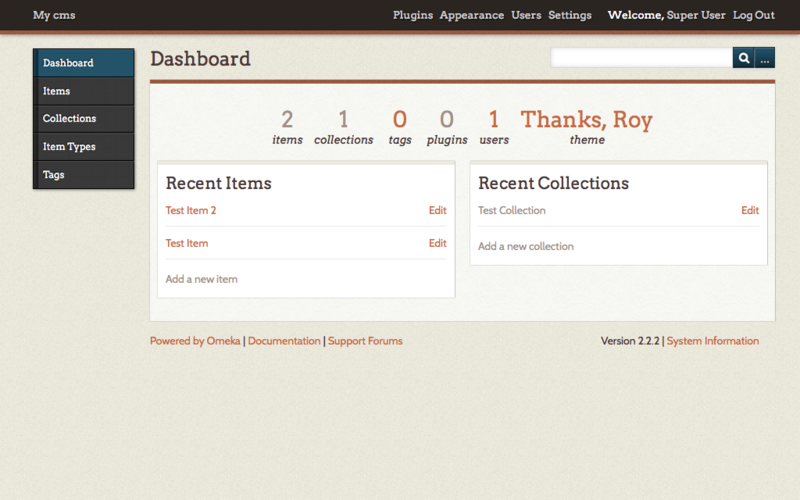 We have also added the ability to use PHP’s GD extension for creating file derivatives when uploading. This is in addition to the options to use either PHP’s Imagick extension, or the default external imagemagick. This should allow easier setup on some servers. Read more about configuring thumbnail creation here. Another change is that the drop-down menu in advanced search for “narrow by specific field” now sorts the fields in the same order that you have arranged them, rather than sorting alphabetically, making it easier to find the fields you use most when searching. There are a large number of bug fixes for this release, including issues with assigning tags, some tags being treated as case-sensitive, fixes to some upgrade errors, resolving an issue with multiple text inputs and advanced search, display of item search filters, theme overrides on plugin views, over-escaping on certain attributes and page titles, and errors which could cause index records to fail. The Norwegian (no) translation has been moved to Norwegian Bokmål (nb). New translations for Bulgarian (bg_BG), Korean (ko_KR). 26 Novembre 2014 - 80MBThis release is the second maintenance release in the 2.2 series. Users of earlier versions are recommended to upgrade. Omeka now supports shortcodes for embedding content such as a list of recent or featured items, as well as plugin content, such as a map from the Geolocation plugin. The new Simple Pages plugin bundled with Omeka supports shortcodes in the page text. 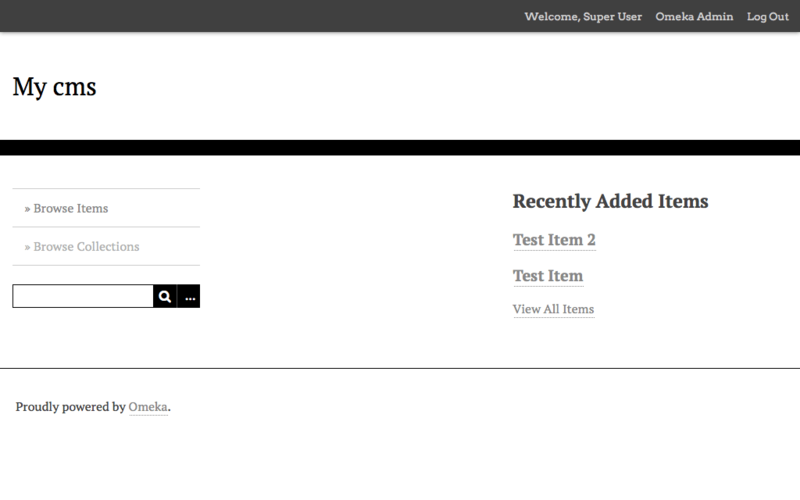 New interface for manually resending the user activation email message to a user.